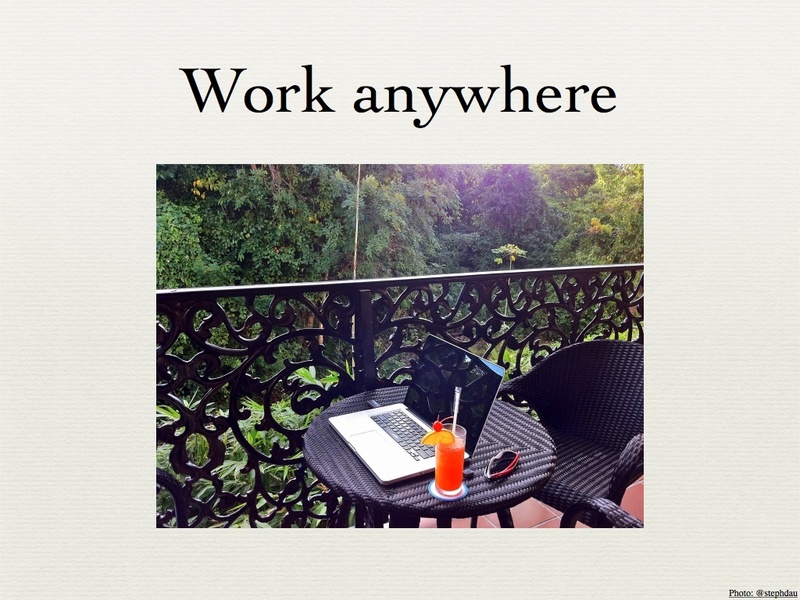 Update: I gave a similar presentation at LeWeb about the Future Way of Working: the Distributed Company. I gave a presentation in Italian at the Digital Communication Forum in Milan in February, and I spoke about “The New Digital Company: Online, Distributed, and Transparent.” I wanted to make those slides available immediately, but since the talk was an Ignite, a flash talk given in 5 minutes with 20 slides that appear on the screen for only 15 seconds, the slides are usually more visual than descriptive, so in lieu of recording my speech in English, I’ll walk you through a few of my slides. 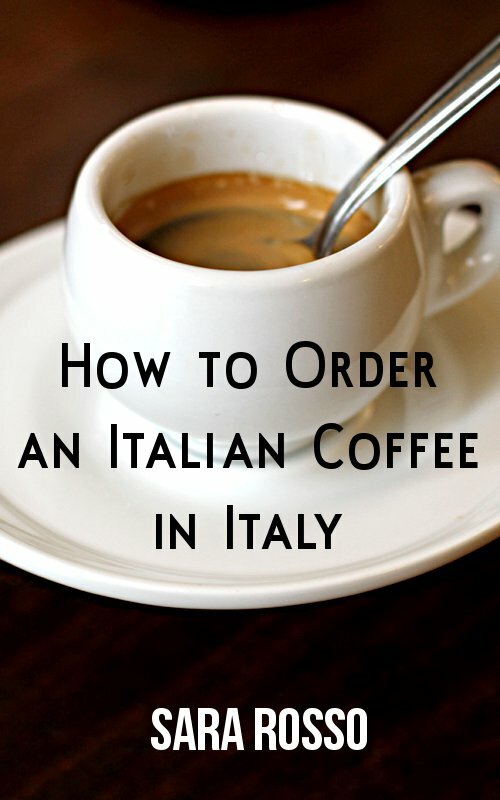 At the bottom are both the complete Italian and English slide decks in Slideshare in case you feel the need to share or embed them. 🙂 There’s also a video of my presentation in Italian available. The first point is “Be distributed.” The subtext of this slide is that the definition of a company is changing: it is no longer an office, a set of desks, and meeting rooms. The company is how and where you make it, and having a distributed company is more appealing than ever. 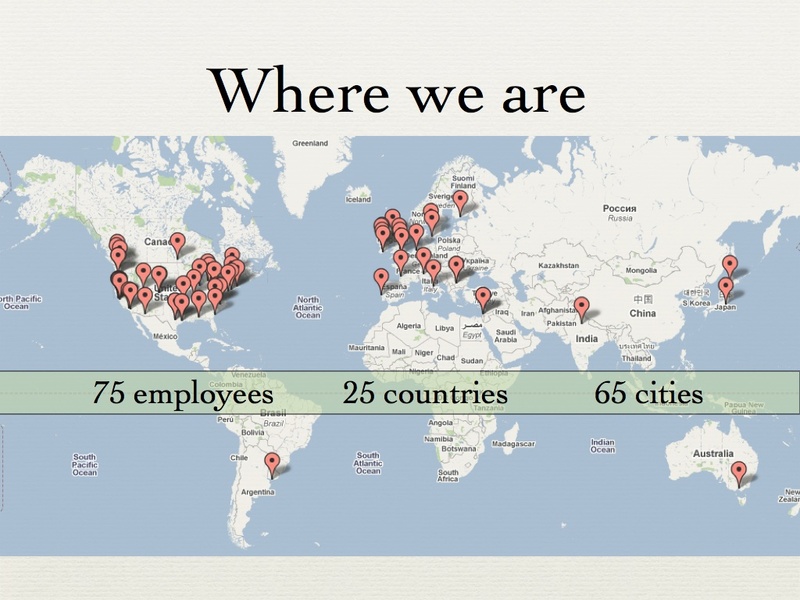 Automattic is a distributed company, with 75 employees in 25 countries and 65 cities. The highest concentrations of employees is in the San Francisco Bay Area, where we have a Lounge that is not an office but an occasional event and meetup location. The second-highest concentration of Automatticians is in Sofia, Bulgaria (4). 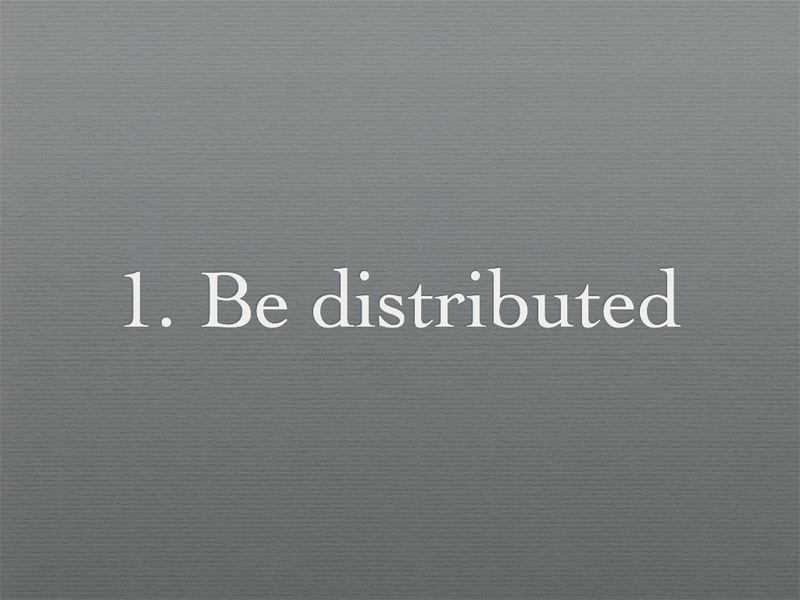 Why should a company be distributed? 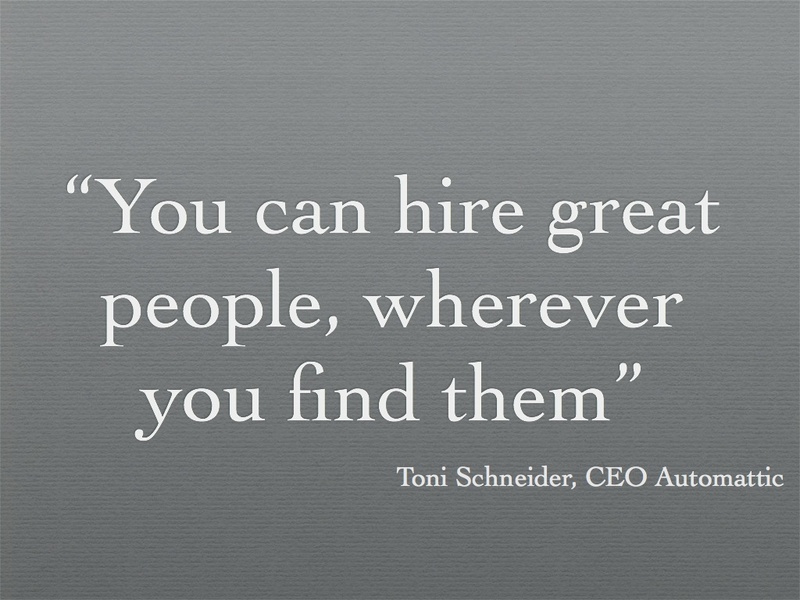 As our CEO Toni Schneider said, “You can hire great people, wherever you find them,” allowing your company to grow organically where talent is to be found. The company receives applications from people all around the world, who would never have dreamed of applying if it weren’t a distributed company. Employees are not forced to move to a specific city with the company’s office and uproot their whole life in order to work for a great company. Further still is the freedom a distributed company allows the employee to construct his/her work environment, from the location to the timing. The concept of: being in the office = productiveness is no longer applicable, and the flexibility allows the employee to work when they feel more productive, to take breaks when they aren’t, and experience other environments if desired. Of course, this has to be balanced with the demands of clients if the worker is client-facing, and also if the employee prefers to be around when the bulk of the company is online and tranascting business (many do, and adjust their schedules accordingly no matter what time zone they live in). A subtext of working from anywhere and not working in an office is that proactiveness and managing one’s time becomes of utmost importance. (the photo is actually one of my colleagues’ photo – he often posts his interesting desks from wherever he is). 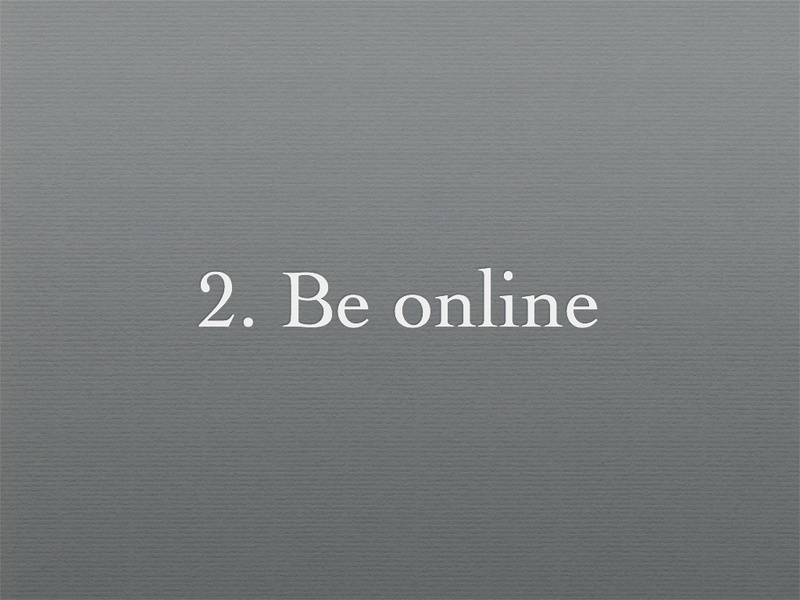 The second main point is “Be online.” Many companies feel that they are online because they have a website where they communicate about or sell their products and they’re present on a few social networks. Be Online is about shifting the entire inner workings of the company to online – from discussions to decisions to documentation. Note: I don’t consider email online as it’s generally not consultable by others. 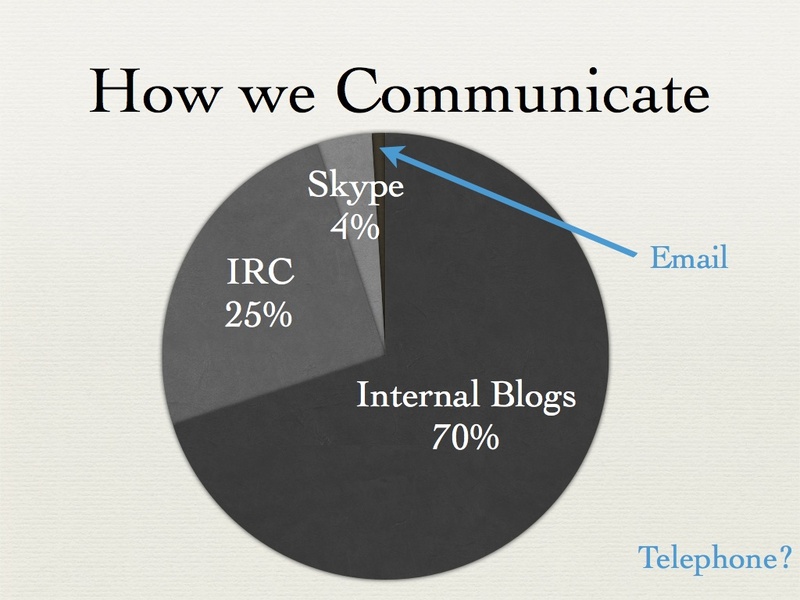 This is one of my favorite graphs which illustrates how a digital company can communicate internally – most of our communication happens on internal blogs, followed by IRC (a private company chat), Skype for personal, 1-on-1 communication, and a small percentage for email, which is mainly outgoing with clients. Interviews, trial projects, and training all happen online, which reduces the need for in-person events, and it can mobilize a greater part of the company to participate since the geographic restriction is removed. Here’s a picture of a traditional meeting – 6 people sitting around a table with computers open, dazed looks on their faces, and surely they’ve been in this meeting much longer than necessary. 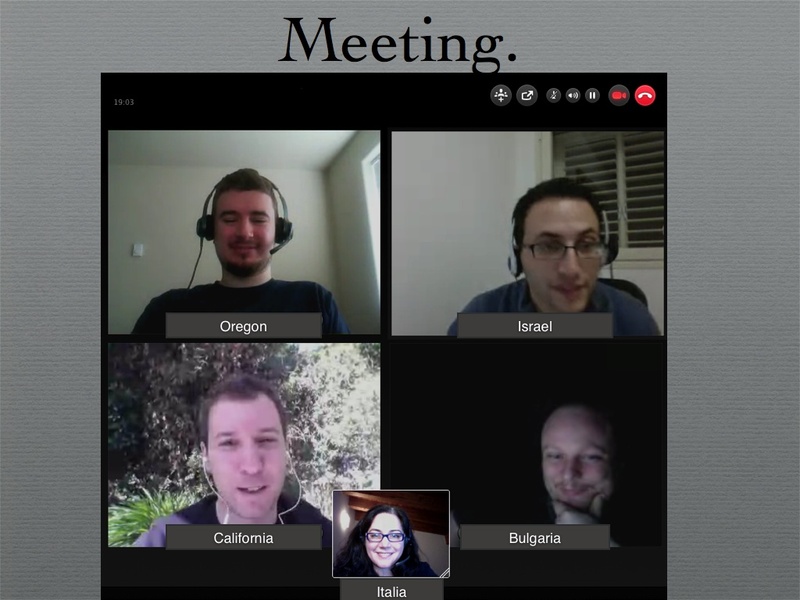 Our meetings, when we actually have them, look more like this – different parts of the world connected by Skype for brief moments. 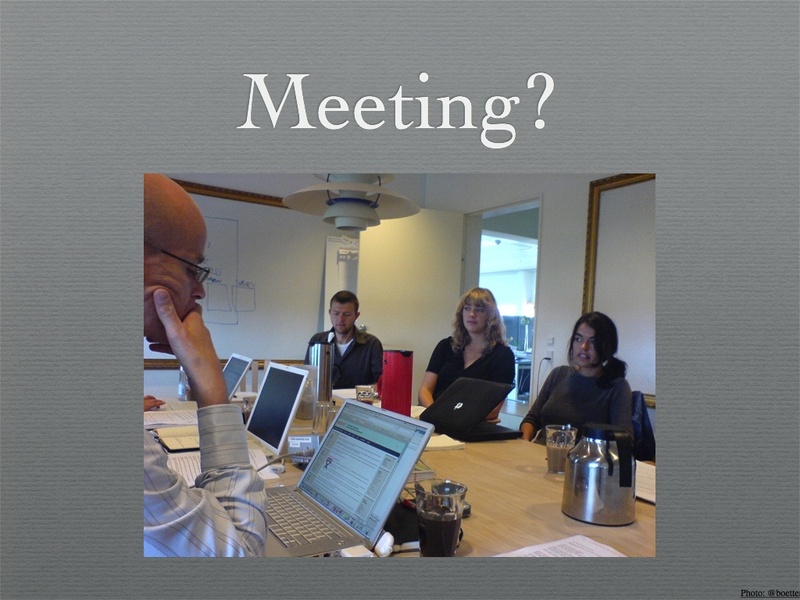 Thanks to Skype video we see each other, too, but our team meeting is once a week and more about talking about things we didn’t discuss online and generally hearing how everyone is doing, outside of work, too. It’s more of a human meeting than one with action items, and we try to keep it short, just 30 minutes. Everything else is a non-meeting. 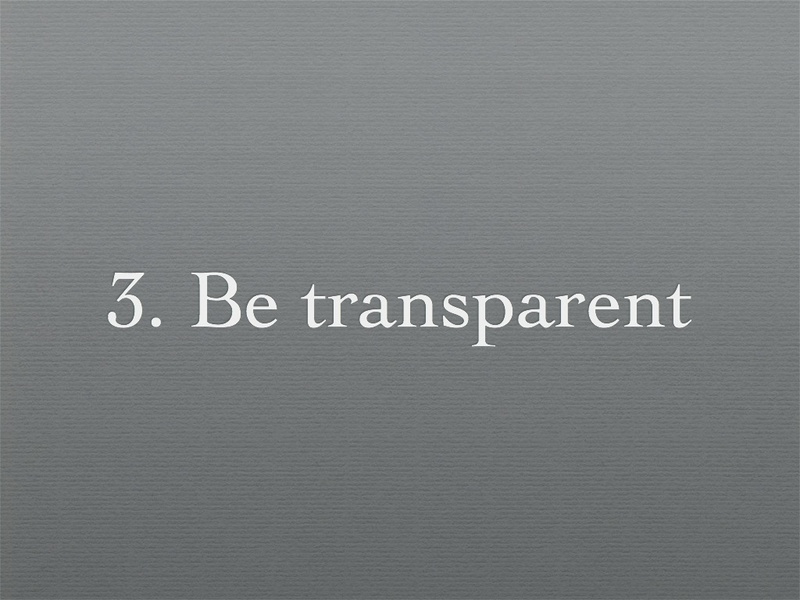 The third point is “Be Transparent.” Transparency plays a big role in a distributed company because physical distance between employees becomes less important than the distance between the employee and the information they need to get their job done, including the discussions and decisions I mentioned before. Our internal blogs are broken down into teams, cross-functional projects, and also watercooler blogs which are outlets for us to chat and have fun, too. They serve not only as an intranet & knowledge, but they are our primary communication tools. This works because as I mentioned before, discussions and decisions all happen ON these tools, and if a decision is made on IRC or in email, the decision is brought back to the blogs so there’s a record and further discussion can happen – the blogs remain the de facto place where decisions happen. If you have all these tools available but people revert to email for a decision, email will be the functioning tool. All of these blogs can be accessed by any of the employees, no matter what their current projects, team or interest. If a systems team member wants to follow the design blog because they are interested and/or have something to contribute, they can. The nature of these blogs means that all the content is searchable, available real-time, documented, and basically all those things I mention on the slide. I think the results are obviously more important – it creates a collaborative environment where discussions can happen in real-time, from any part of the company, and results in a lot of distributed ideas, instant diffusion of information, and the ability to contribute at any level. The downside of having all this information is that it can be too much noise but there are a lot of ways to combat this including limiting one’s subscriptions to only the most applicable blogs, filtering messages and content based on keywords, and receiving alerts any time your name or a keyword you follow (like your product or team name) is mentioned on any of the blogs. Of course, I couldn’t help but pimp the fact that we use WordPress to power these blogs, and not only WP but a specific theme that enables frontend posting and comments are immediately expanded and visible (comparable to a Facebook or Twitter environment – the backend is of no importance to most contributors) – read more about the P2 theme here (hint: it’s free!) 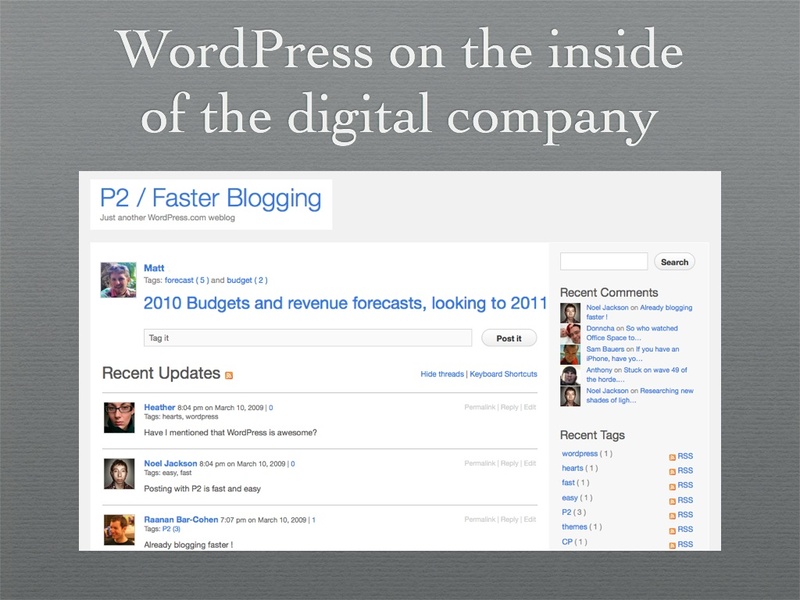 and how P2 changed Automattic. 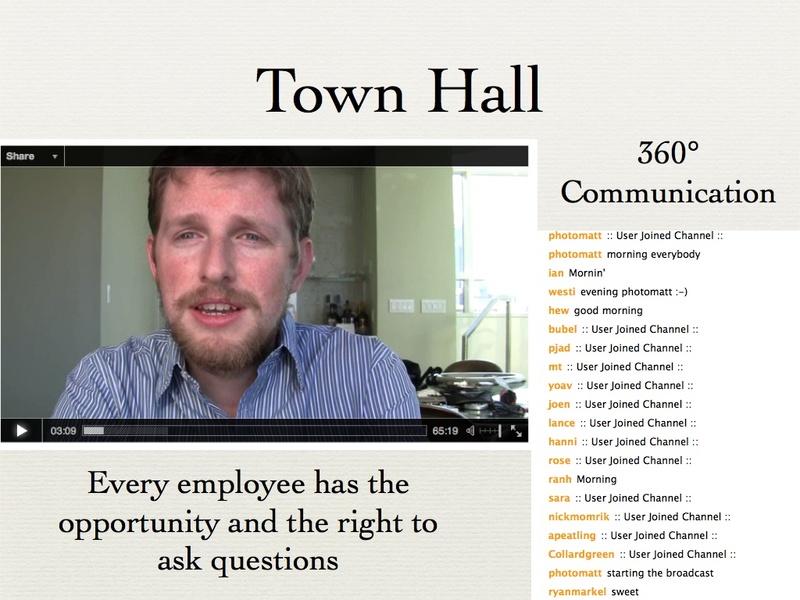 A final way we keep up to date with what’s going on in the company are monthly Town Halls with the President of Automattic, Matt Mullenweg. Often special guests (other employees) are available and any employee has the power to ask a question and hear the answer during the transmission. 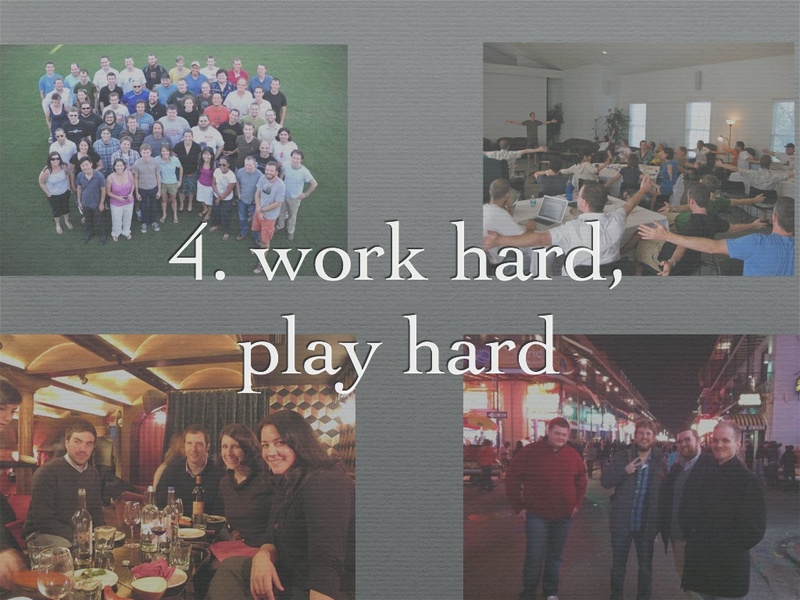 The last point in the New Digital Company is “Work Hard, Play Hard.” A distributed company means that individuals don’t often see each other, so when they do get together, it’s important to remember to enjoy being with each other as well as all the hard work you do when you’re not together. 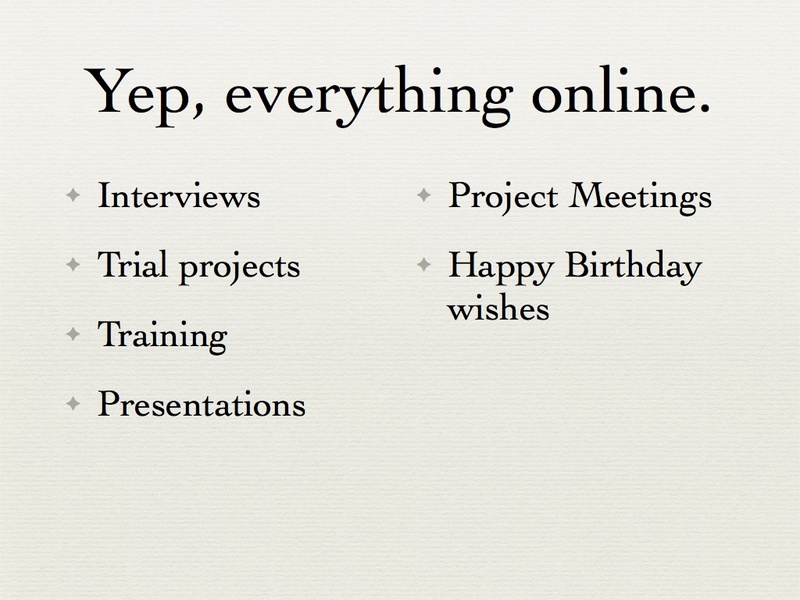 Many meetups are spent doing fun activities and working on short projects that are outside the normal work scope. A few days after I gave my presentation at the Digital Communication Forum in Milan, Automattic posted on the WordPress.com more information about How WordPress.com is made, which includes information about how our distributed company works. You might want to check that out as well. Sara is your in-house geek, sharing tech tips, biz Info and how-tos to bridge the gap between meek and geek. #Seattle really showed off its Sunday afternoon style. Snow...what snow? I’ll keep this sun in mind over the next few rainy days. And then we ate a #seafood feast. Or tried to. Buongiorno Seattle and the land of coffee! Will be trying to fit as many #espresso in as possible around work stuff; thank goodness for shops with 6:30a open time on a Sunday.